This post provides details of becoming Virgin Atlantic Cabin Crew. Virgin Atlantic advertises all of their current openings on their website. Once you find an opening that you are interested in, an online application is filled out along with the submission of your resume to the airline. Now, this may seem very simple but don’t get too comfortable! Included in the application are questions aimed to learn more about your personality and some motivational questions to decide if you meet the criteria that Virgin Atlantic is looking for. Now, if you move on to the next step in the process, you will be asked to submit a video interview where you will be asked to answer questions that center around Virgin Atlantic’s brand. If they feel you have what it takes to become a member of their team, you will be asked to attend an assessment day. These assessment days consist of group activities to demonstrate your teamwork skills and problem solving skills as well as sitting on a crew seat and reaching the overhead bin. Being a certain height is actually very important when becoming a cabin crew member! There will also be a short test on your assessment day followed by an interview. After this full day, everyone will be sent home and the successful candidates will be chosen! For a very intense few weeks, the newest members of the cabin crew will be put through rigorous training. Some people won’t make it through these weeks but if you are determined, focused and study for the multitude of tests, you will do it! The training will take about 6 weeks and includes exams everyday, emergency landings, fire training and security and ditching in water. The training is very physically demanding and can be emotionally draining but so worth it! You will learn all about the different Virgin Atlantic aircraft types, where everything is on the aircraft and you will also be tested on life support protocols. Nervous about the training? I have it all covered in my Becoming Cabin Crew e-book. Unlike some airlines, such as British Airways, there is only one fleet at Virgin Atlantic, so you are all one big team! Your rosters will differ every month but your flights will generally consist of long haul flights with a day or two stopover in the destination. Virgin Atlantic does the occasional charter flight which might be short haul, but otherwise all of their flights are long haul. Working for Virgin Atlantic is great because they fly to some amazing destinations which you can explore during your stop overs. They fly to many holiday destinations as well as cities. Some destinations do not have regular flights, which means an extra long stay for you as crew too! Virgin Atlantic cabin crew are paid industry average in terms of wages. Their salary is made up of base pay (around £13,000 per annum), trip pay (£25 per sector) and an overnight allowance. The overnight allowance varies depending on how long the trip is and the destination. This money is loaded onto a a debit card, known as the ‘little red card’, and you get to keep the money that you don’t spend. You are also entitled to generous staff travel benefits. There is no need for accommodation when working for Virgin Atlantic as you will be based at either London Gatwick or London Heathrow, where you will be expected to have your own accommodation. High quality hotels are provided down-route. Are you looking for a job as Cabin Crew? Don’t let the chance slip through your fingers… make sure you have the right resources to maximise your chances of getting the job- check out my resources for Prospective Cabin Crew now! For more like this visit www.becomingcabincrew.com, a Cabin Crew blog written by Hayley Stainton, a Dr in Aviation and Tourism Research. It is all about tolerance, patience and acceptance. I still remember the moment of my interview in Bucharest with Emirates representatives when all candidates argued in front of the recruiters that they want this job because the want to experience cultural diversity. Because it sounds really exciting to share stories or to work in a diverse team. This is totally true, but there is a little secret that you maybe not know: during the 2 months of training, in the form of tests intentionally disclosed or taken by surprise, students are being cathegorised and by this measure they will be selected for the future flights. Depending on the personality of each student, of the way he reacts in emergencies, but also by the interaction with each other, all future flight attendants receive a “label”. I used this word not to make someone feel like an object, but when the company employs 25,000 cabin crew, at some point you become just a number, and I consider this to be a sad thing. Moving from a small company where everyone knows the personality and preferences of everyone to a more than multinational company in my opinion, was a huge change which caused me sadness put also joy. It’s a nice feeling to know that your job ends once you leave the airplane, and if you do your job and passengers leave happy and satisfied, it means that you had a productive, successful day, and you can go home with a smile on your face as you did everything it was in your power to implement the values with which you have identified yourself in front of employers, so in front of the company itself. Coming back to the diversity term, you can look at this aspect exactly as your heart dictates in the sense that you can make friends easily or can you limit your job to the requirements relating teamwork, but from experience I can tell you there is not enough time to know a person in only one flight. There are many steps along the way, passengers you have to be aware of above anything, and these things don’t allow you to get to the heart of your colleagues in order to known them better. Time is very short, and sometimes you become a small robot who wants to end the flight successfully and to go home peacefully. I could say that that’s the sad face of a day at work, but because I am that kind of person that changes her mood at 180 degrees in one second, I remember all my long flights and immediately I’m taken back by memories which I will remember smiling all my life. All flights involving a layover bring people together, creating a real team, and giving you the opportunity to meet the person behind the uniform. There is enough time for service, passengers and their needs, dinner break and finally for giving attention to the one next to you. It is very important to be an open person, to accept people you are working with and not judge them no matter what happens always thinking about one important word: DIVERSITY. Before you say something or you react in a certain way, you have to be always aware of the fact that “normal” is a word with a different interpretation because what is normal to me may seem odd, unormal, new, to you. The plane can been seen as second house where there are living different people. It is true that English be an obstacle, but the body language, the smile and the eyes will always reveal one’s intentions. Even though once I moved to Dubai my English was not perfect, I loved it, embrace it and I always felt that there is something more than words. That something which approaches people from all corners of the world. Always remember that tolerance, acceptance, kindness, are just a few of the qualities which define us as people and it would be a pity to lose them. Human being is indeed the most complex creation! Join us on an exclusive 4 days cabin crew interview preparation course. We’ll share everything you need to know to pass the cabin crew interview stages, we will edit your perfect CV and take professional pictures for your online application. At the end of the course, you will be fully prepared for an interview with any airline company. Book your seat now! It was my first month flying for Emirates and I had just landed in Dubai after a very long flight from the Philippines when I decided to check out the roster again. I had done this check somewhere at around 11.40 P.M, and the mistake that cost me afterwards was that I did not give importance to the date in which we found ourselves at the time. My roster was showing as follows: May 24 FREE, May 25 flight to Kuwait at 01.15 AM. After my interpretation I had two days off and the third day night departure to Kuwait. Checking date: May 23, flight date May 25. So from my calculations resulted that I get home, I have all the next day to enjoy Dubai, and the day after, in the night, go for Kuwait flight. The theory of an unexperienced and tired flight attendant. In reality, I had only one day off as after midnight I was already on May 24, and flight time being on May 25 at 1.15 A.M which meant that my preparation should start on my day off around 9 P.M. The fact that I did not checked the flight schedule carefully and I did not taken into account that it’s already 00.00 wich meant the beginning of another day, led me to failure for that flight. I spent my first day off at the pool, in the evening I went out for a walk, and after that I went home where I felt asleep peacefully with the thought that it’s so good to have days off when you can really explore life in Dubai. 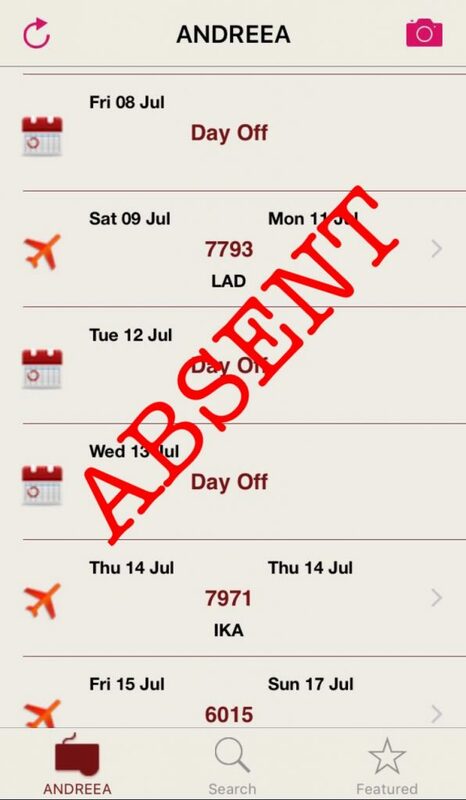 But the next day early in the morning, shock and horror in my roster: “ABSENT” was written with big block red letters for the Kuwait flight. Initially I thought my phone or application was affected by the heat or the application got stuck, but after I called the number of the Crew Support, I was shocked to find out that I really missed the flight, and this incident will be documented in my file for the next six months. The first instinct was to cry because I was very nervous and it was not my intention to miss the flight, but after a few minutes I realized that I should calm down and explain to my manager what happened in fact and what was my reason for not showing up. Following this incident, which by the way I could have cost me being promoted I began to check my application twice on the phone, ask another opinion if I was too tired to figure it out, or even to use the Crew Portal which was conceived to avoid such situations. One thing is certain: the cabin crew job makes you forget most of the times on what day of the week you find yourselves, what date and what time is at home, and that’s just because your home is up in the sky! When we landed back in Bucharest, I realized with Georgiana that, beside our luggage, we came back home with a lot of good energy, new ideas and a life experience witch made us love our work. After this first course held in Rome, I know that this city will become like a second home very soon. In the next months, How to be Cabin Crew wants to extend more and more in Italy, the country in which we will start to organize courses very often. We plan to launch a permanent preparation center in Rome, like we did last year in Chisinau, Republic of Moldova. But about that we will discuss in the following months. At our first How to be Cabin Crew course in Rome, we had students from Italy, Belgium and Switzerland. For 2 days, our students assimilated extremely useful information about what it means a successful interview, they learned very much through practice (practicing the task from the interview and lots of exercising to highlight their creativity and team spirit), they improved their English language and learned to have confidence in themselves when they are going to an interview. In the end, to me, as a trainer, and to them also, was very difficult to say goodbye so soon (I think we did it like 4 times before we actually left); we promised to meet again very soon, and till then, to keep in touch online. Once again, How to be Cabin Crew helped dreams come true, built beautiful friendships and offered wings all over the world. How was our first How to be Cabin Crew course in Rome? It was incredible, this will be the answer. Incredible because I never could imagine that we will get these far, incredible because so many people from all over the world are watching us, read us and choose to prepare with us, incredible because we managed to make such a big step forward and we won this bet to start making courses all over Europe. And you know why it is incredible? Because of our hard working team which works every day to make How to be Cabin Crew better day by day. Because of Georgiana, Nicoleta, Cristina, Aida, and recently Ana, with whom I know I can move mountains. Darlings, don’t forget that the sky has no limit. You can dream as far as you wish for, important is to fight for you dream! Antonia Talianu is one of the flight attendants who amazed us with their life stories. Now 32, she is a graduate of the Faculty of Journalism and Mass Communication, at University of Bucharest. Seven years have passed since Antonia went to Middle East to make a dream come true. Although it sounds like a cliché, she always wished to fly. At the early age of 15, she got a job that could allow her to travel, doing it whenever possible. Antonia told us how life as a flight attendant gave her freedom in many ways, from the way of thinking to the financial leeway. In a few months, she will become a mother, accomplishing her dream of having her own family too. Oman Air, Etihad Airways, and Emirates Airline – an impressive chain of Gulf carriers for which you have worked. How did you find out about the interviews and how were they conducted? To be sincere, at that time, you could gain access to more information only after getting hired by a Gulf airline. Unlike now, when there are so many forums, Facebook pages, or even personal development and professional counseling programs. I have found out about Oman Air from a job offers website. After applying, I was invited to a hotel, together with other 500 girls. It was the first time Oman Air was coming to Romania. The interview process took three days, and with each day passing, we were fewer and fewer. Eventually, 20 girls were chosen, but it was only me and a girl from Piteşti who had the courage to embark to Oman. For Etihad Airways I’ve applied while I was already flying for Oman Air. I wanted a change, to really see the world, as Etihad Airways had many more destinations. The interview was quite difficult. I flew 45 minutes from Oman to Abu Dhabi. When I arrived at the Etihad head office, I noticed there were not more than 1000 girls who had come for the Assessment Day from all over the world. We started talking and I had around me there girls coming from America, Australia and even Venezuela. Some of them looked like real supermodels. The interview wasn’t different from that of Oman Air. It was a tough selection, lasting one day. We had no time to waste, but only to stay focused. At six o’clock that evening, we were 20 girls and boys waiting for the face-to-face interview. After that, I returned to Muscat, back to my work. In two weeks, I received my visa through an email, together with my air ticket. Emirates, I have to admit, was my last attempt to live in the Middle East. As a First and Business Class Lounge Supervisor, I wasn’t flying anymore. They contacted me after finding my profile on a website, so that it wasn’t necessary for me to apply. At first I thought it was a joke made by my friends from Abu Dhabi, Etihad Airways being the only airline offering low-fare tickets not only for family, but also for friends. What followed was a Skype interview. After two days, they invited me to a face-to-face interview, sending me an air ticket, the visa and the hotel reservation. 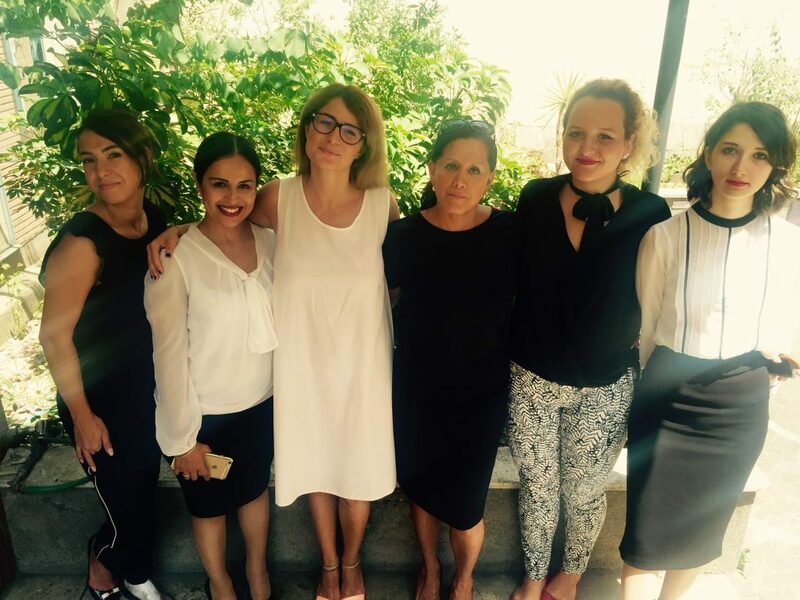 Out of the ten Romanian women coming in Dubai for the interview, I was the only one successful. After two weeks, I moved into a studio and started the training. How long did you work for each airline and how were you promoted? Oman Air is the airline of my soul. It was there where I have learned everything about culture, religion, mentality and behaviour. I have lived there for three and a half years. But I can honestly say it was thanks to Etihad that I become more mature. They are stricter, but also more respectful. I have been working there for one year and a half. Lastly, Emirates seemed incredibly relaxing to me; I was a different person then, more mature and with some experience behind. Besides, I used to work four days and have the next four days for rest. At that time, Oman Air didn’t have its own system of promotion. After three tiring months of turnaround flights on a Boeing 737, I have shifted to Airbus 330, which meant flights to Europe and layovers, finally. It was the period when Oman Air was purchasing bigger airplanes, starting its flights to Europe. Etihad Airways is an airline that cares for your personal development. So after six months, I applied and received the Cabin Senior role, being in charge of the whole Economy Class. My wide experience with Oman surely had a say on it. In case of Emirates, it is not easy to get promoted, being a ground employee, even already a supervisor. In order to reach the next level, you must speak Arabic. Although I speak, write and read in five different languages, it did not make any difference. For which one of the airlines did you most enjoy working and why? I have most enjoyed working for Oman Air, as I had the chance to acquire everything step-by-step. The Omani people are extraordinarily friendly. That is why I have stayed there for three and a half years, starting from the Economy Class and after three months progressing to the premium classes. Wage differences weren’t too big between classes, but this was my opportunity to deal and interact with high society and royalty. What was your favourite destination and why? My favourite destination will always be London. I like to call this city “the country with all countries”. In my opinion, like any other big city, London makes it possible for you to experience different cultures, nationalities and various foods. I have long been fascinated by London. From Etihad I received the chance to visit it very often, through the monthly flight schedule which is built on your level of speaking a certain language. What were your day off activities while living in Muscat, Abu Dhabi and Dubai? In Muscat you don’t have many possibilities, except clubbing and exploring Oman. I have been hiking, visited oases, slept in a Bedouin tent in the peaceful desert and also found a family, with whom I still keep in touch, even now, after seven years. As for Abu Dhabi, there is a beach and entertainment everywhere; moreover, your cabin crew ID card lets you join all of the clubs and exclusive parties in town. About Dubai, I could say it was made for partying; but, as I had already experienced it, I preferred instead going to the beach or escaping everywhere around the globe for four days. How would you describe your flight attendant experience at Oman Air? My experience at Oman Air gave me the confidence I needed to get through all the interviews. I have always felt confident in my knowledge gained there, as well as in my life experience. My advice to both my friends and others who just look at my photos will always be to leave for the Middle East. What you learn there compares to nothing. Some of my happiest moments were those when I was taking by the hand a passenger afraid of flying, saved a life on board, and made someone smile through a small gesture. I could also improvise a vegan menu for someone who couldn’t have meal. I consider it the only possible way to resist tiredness and time zone changes. Why did you give up flying? There comes a time in life when you realize you want something else. Personally, I gave up flying because I was dreaming to have my own family and I didn’t want to lose any time. I have seen the world and spent all of my holidays in America, exploring each state one by one. My passport is out of blank pages for visa stamps. I had the opportunity to live an extraordinary life, filled with experiences and lots of things to learn. How did you feel during your last flight? This question makes me smile. My first and last flight had been both to Beirut. My colleagues used to nickname me “Dubai – Beirut”, which represented Oman Air’s longest flight; I was flying there at least four or five times a month. So I ended my flight attendant career with a last flight from Abu Dhabi to Beirut. They called me while I was at my base, in home standby, packing to come back home to Romania. I was on call until the very last moment. How’s life in London, now that you are done with aviation? Life is what you make it. In London, you have freedom and opportunities to do whatever you want. I don’t work in the aviation field anymore, but as an assistant building manager in an office building, I still get to meet pleasant people of many nationalities. The difference is not so significant, except now I am always on the ground, working from 8 a.m. to 5 p.m. and having my weekend free. You can prepare for the upcoming interviews by attending our two day intensive training in Rome. Find more information about the course here. Meet How to be Cabin Crew in Bologna! Our team will be in Bologna next week, eager to meet you! We are hosting a nice meeting with our readers, on Tuesday 8th December in one of Bologna’s cozy coffee shops. Would you like to know more about the cabin crew career and how to get a job among the clouds? Come along to our information meeting on Tuesday 8th December 2015 in Bologna! We are very excited to get to know our Italian readers and not only! It’s a great opportunity to network, meet people that are passionate about aviation and find out useful information regarding the cabin crew job. We would like to invite you to come along and find out more about the options for landing a cabin crew job. We welcome potential cabin crew who are interested in finding out how they can get hired by major airline companies from Europe and Middle East. Our meeting will start at 6.30 pm and you are very welcome to join us for the meeting or at any other time, as you wish. Our team will be available to talk about anything you wish to regarding the steps you need to follow in order to become a cabin crew, the life of a flight attendant, the advantages & disadvantages of the job. How to be cabin crew trainers will be also host a couple of private coaching sessions for those of you interested in learning more about the interview and how to pass it successfully. Our private coaching session are an amazingly effective and efficient way to achieve your career goals. A trainer with strong experience in the aviation field will guide you into the recruitment process in order to achieve the best results. Through private coaching, we customize the learning process to meet your needs. We are happy to design a package that works best for you. We are here to give you wings! What are you going to study during our private coaching sessions? Book your seat now! Write us at wings@howtobecomecabincrew.com and we’ll plan together the most appropiate day & location for your private coaching session. We will be in Bologna from 7th to 9th of December! If you are interested in applying, come along to the Air Serbia Open Day in Novi Sad and Belgrade. This is a great opportunity to drop off your CV with one of their recruiters in person and ask any questions you may have. You may then be shortlisted to attend an Assessment Day. A copy of the email you will receive in response after submitting your application online. Male: business suit, this means a suit with a tie, your best choice is to go for a dark colored suit. Female: business suit, this means a jacket and a knee length skirt or trousers. Casual clothes are not acceptable. Cabin crew are required to keep a very neat hair style. If you have long hair, tie it in a neat bun at the back of your head. When it comes to makeup, less is more. Natural color eye shadow and red lipstick works best. Your nails should be well-manicured, clean and of medium length, with a transparent or neutral-colored nail polish. Depending on the number of applicants, you could encounter lengthy waiting periods. Air Serbia is the national airline of the Republic of Serbia. They serve more than 30 Euro-Mediterranean destinations directly from their hub at Belgrade’s Nikola Tesla International Airport. They also offer long-haul and international destinations in Asia, Australia and the Americas through their codeshare partners and their shareholding equity partner, Etihad Airways, the national airline of the United Arab Emirates. Air Serbia currently operates a fleet of 19 aircraft, comprising 2 Airbus A 320, 6 Airbus A 319, 4 737-300, 3 ATR 72-200 and 3 ATR 72-500. Thank you for taking time to apply for Cabin Crew and good luck! Join us on an exclusive 4 days training course. We’ll share everything you need to know to pass the cabin crew interview stages, we will edit your perfect CV and take professional pictures for your online application. At the end of the course, you will be fully prepared for the interview. Book your seat now! Safi Airways is looking for female cabin crew. You can apply for this job until 30/11/2015. Safi Airways Cabin Crew are dynamic, professional, outgoing and challenge themselves daily. They are ambassadors for their brand and strive to maintain a positive and healthy professional image. In order to be successful, it is important to present yourself well at every stage of the process. Before starting your application with Safi Airways, you must ensure you meet all the minimum requirements. You may email your CV along with a coloured passport size photograph and a full length coloured photograph to careers@safiairways.aero. Only completed applications will be considered for shortlisting. The shortlisting process involves a detailed review of your CV. Our recruitment experts take into account your qualifications, overall experience and other relevant factors. Your application will be shortlisted if you meet the minimum criteria. Safi Airways was founded in the year 2006 and established itself as Afghanistan’s privately owned international airline. Safi bridges the market gap for a friendly, affordable and safe airline providing a quality service for travellers to and from Afghanistan. Safi Airways offers the highest international safety and service standards. It is owned by Safi Group of companies, a diversified conglomerate based in Dubai, United Arab Emirates. The airline has its headquarters in Kabul, Afghanistan and an administrative office in Dubai. Do you aspire to work for the best? Are you keen to break away from your nine-to-five routine? Would you rather be working at 36,000 feet in a fast-paced environment, delivering outstanding service to a wide range of customers? If that’s you, then we want to hear from you. Every day, BA CityFlyer Crew provide exceptional service to thousands of business and leisure customers flying into the niche market of London City Airport in the heart of London and beyond to Europe. BA is looking for exceptional, customer-focused people to come and join our team. You should have a positive attitude coupled with high standards of professionalism and genuinely enjoy helping customers, solving problems and making sure everyone has an exceptional flying experience with London City Airport’s leading airline. As Cabin Crew, your role will focus on maintaining the highest standards of safety and comfort on board for our passengers and crew. To join BA you will need to bring an understanding of our customers’ expectations together with excellent communication, interpersonal and team working skills. Self-motivated, flexible and adaptable, you’ll have a professional, positive attitude to work and a solid commercial awareness. BA will be reviewing applications on an on-going basis and are planning to assess candidates at our London City base. Please be aware BA has limited assessment slots, so we recommend you submit your application at the earliest opportunity. CityJet staff are rewarded with excellent salary and ancillary benefits including worldwide concessionary air travel, pension and discounted healthcare. Once your application is received you will get a confirmation and we will keep you fully updated with the progress of your application at all times. Cabin Crew are primarily responsible for passenger safety and comfort whilst on board a CityJet aircraft. Cabin Crew are also responsible for the delivery of In-flight service and for providing an excellent customer service experience to the passengers. Primarily be responsible for passenger safety, comfort and well-being whilst on board. Maintain the highest personal standards of safety, dress and appearance, attendanceand punctuality. Work closely with the Cabin Crew Management Team to ensure that all practices are inaccordance with the organisations Ops Manual and HR policies and procedures. Promote a harmonious working environment. Maintain the highest of onboard standards at all times and present a professional andwell organised in-flight product. Maintain an excellent standard of personal and corporate grooming. Maintain consistent, high standards in all regulatory examinations. Remain medically fit (assessed & evaluated) to meet requirements. Good luck & see you up in the clouds!